Well, it's a New Year. May 2014 be all you need it to be. I'm praying for some peace and tranquility for me for this year. Last year was hectic to say the least. A New Year means taking stock of lots of things. In my case this year it's my knitting goals and aspirations. My first knitting related action of the 2014 (apart from actually knitting) was to join two stash buster groups on Ravelry. My stash is not enormous but I need to make a conscious effort to think about just what's there and try to search out things that I can knit with it before I go and buy more yarn. A lot of what I have in the stash is small bits and pieces of acrylic mainly with a few larger amounts suitable for acessories such as hats and cowls or possibly shawls. I thought for 2014, I have a go a curating these 125,000+ free patterns into small bite size digestible chunks for people to use. As it's a year of Stash Busting for me lets start with a list of patterns for using up little bits of left over yarn using both knitting and crochet. The criteria I used to put this together is that all the patterns be free and readily available on Ravelry (without needing a Ravelry account necessarily to access and download). In most cases they are also patterns that would work with a range of yarn weights. Most of my little bits of stash are DK weight or 5ply. The final criteria was that they had to have that little bit of WOW factor that made me want to make them. 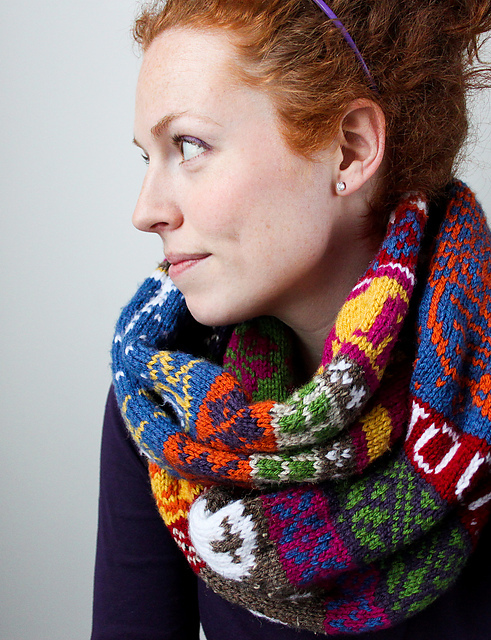 My Favorite Things Infinity Scarf - a recipe for a personalized design your own colour-work cowl by Jill McGee. My version of this became the first cast on object for 2014. So far, I have a steaming tea cup, a row of European style houses, a Tardis and some foxes. Owl Key Chain Pattern by Yarn Artists. Owls are just so cool right now. This pattern is an awesomely detailed photo tutorial on just how to make these little guys. I'm planning to make a whole heap of these over the next year to use as tags for Christmas presents. Have lots of quite little bits of yarn? 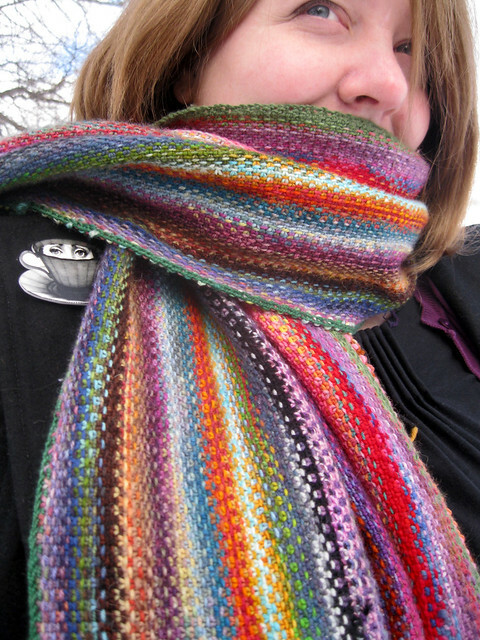 The general advice is knit a muli-coloured stripey scarf. 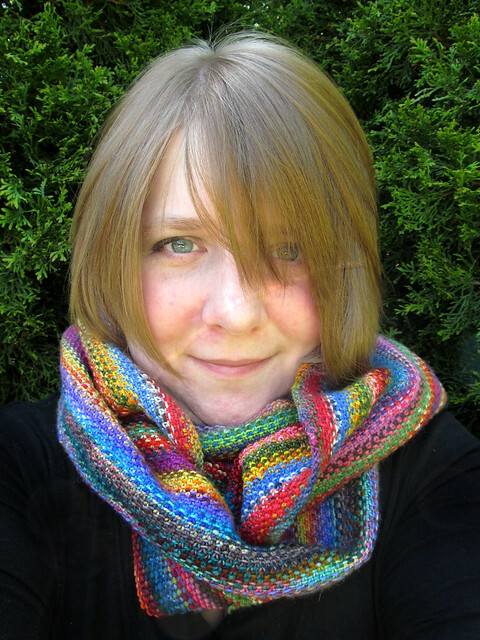 Why not try the Mini Mania Scarf and Manic Panic Cowl by Sarah Core. These are just a little bit out of the ordinary using linen stitch to create a woven look fabric. Most people think of the stash busting granny rug. (I'm doing the crochet version of this idea myself at the moment very slowly (see my blog post Granny wants a Latte Macchiato). 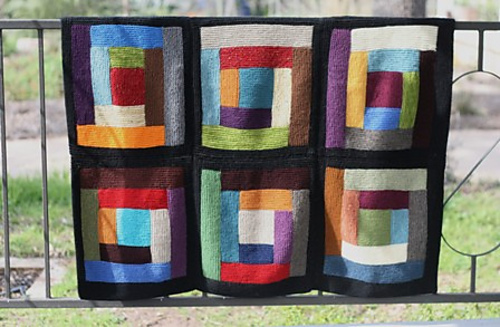 However, I really love this knitted take on a traditional log cabin quilt. 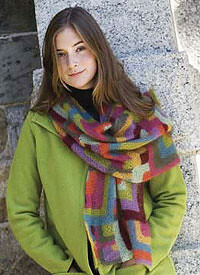 Learn to knit a log cabin blanket by Staci Perry. Modular knitting is also a great technique for stash busting. Modular knitting is the idea of constructing a knitted garment from smaller shaped pieces of knitting. The shapes chosen are usually geometric such as squares rectangles, hexagons, circles, etc... These can either be seamed together or more traditionally the garment is built from successively knitting small pieces of knitting onto an existing piece. One of the classic modular shapes is the mitered square. And that's the sahpe used in the Modern Quilt Wrap This one comes from Knitting Daily's free ebook Knitting Accessories: 7 free Patterns for Knitted Accessories. You will need to sign up with an email address to access this. There are literally hundreds of more patterns out there but I thought I keep these lists short. I'll try to post another one every month or so. So what sort of free patterns do you want to make? Any suggestions for topics for the next lists?